Examples of Lyme Ignorance & Personal Stories. Dedicated to raising awareness of ALL tick borne diseases, offering support, and providing referrals for information, research, and healthcare choices. Welcome to the Arklatex Lyme Disease Prevention and Support site. We are dedicated to the prevention of tick borne diseases and support all individuals who are suffering. and to create awareness about the danger of this controversial disease. We are kindrid spirits in our fight for proper treatment, our struggle to be understood, and our battle to reveal the hushed truth about Lyme Disease. We represent a group of individuals in the Arklatex and surrounding areas who have been on the front lines in the battle against Lyme and other tick borne diseases. We feel it’s our responsibility to warn you about the dangers, misdiagnosis and controversy surrounding this horrible illness. But there’s a problem. The current test to detect Lyme Disease is less than 40% accurate. Lyme spirochetes can hide in the human body and fool the immune system into thinking it isn’t there. So, no antibodies are produced, resulting in negative tests. Lyme Disease is in all 50 states and spreading rapidly! The Center for Disease Control states that Lyme Disease is a clinical diagnosis, meaning diagnosis cannot be confirmed on tests alone, but on symptoms. With approximately 300,000 cases of Lyme Disease last year, only 20,000 of those cases were reported, validating the controversy surrounding the origin, testing, and treatment for the illness. The seriousness of this disease is insurmountable. 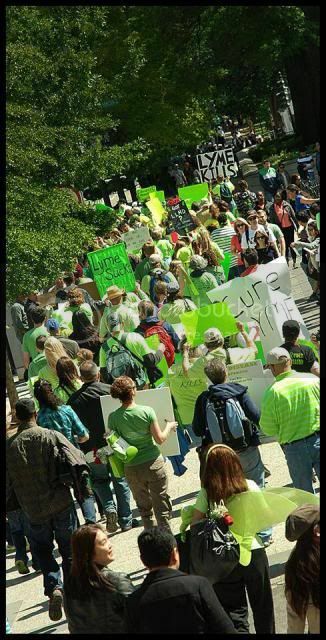 Without activism, the voices of all who suffer from Lyme and tick borne diseases will never be heard. If you are suffering from this disease or have a loved one who is sick or suspect you may have Lyme Disease, please explore this site for vital information. You are not alone! THERE IS NO MEDICAL ADVICE HERE! We are not experts. We share experiences and knowledge we’ve learned from others through public and private networks. Information contained in this site is for information and research purposes only. Always consult a medical professional, unless you are a researcher or health care provider. You have a choice in treatment options. We do not give direction on medical advice. Arklatexlyme.com contains information about the diagnosis, symptoms and treatment of Lyme disease. This site also provides links to resources, support, and information on the Internet. The general information within this site is for informational purposes. Remember, only an experienced physician can diagnose and treat Lyme disease. Be aware.